Michigan Council for Arts & Cultural Affairs (MCACA) is currently accepting grant and minigrant applications for the 2019 fiscal year. Michigan nonprofit organizations, schools and municipalities are able to apply for arts and cultural projects taking place between October 1, 2018 and September 30, 2019. Applications for Operational Support, Project Support, Capital Improvements and Arts in Education grants are due June 1, 2018. Applications for Minigrant Arts Projects and Minigrant Professional and Organizational Development (POD) are due August 3, 2018. Individual artists and arts administrators are able to apply for POD minigrants in addition to nonprofit organizations. A grant workshop to review guidelines and grant writing strategies is slated for Wednesday, 4/25, 11:30-1pm in the Janis Room at NMC’s Dennos Museum Center in Traverse City. Additional workshops will be scheduled throughout the region or can be requested in small group or private meetings with the regrant coordinator. Guidelines can be accessed online at http://www.michiganbusiness.org/community/council-arts-cultural-affairs/#mcaca-grants or by contacting mgillett03@gmail.com. All grants must be submitted via e-grant at mcaca.egrant.net. For questions, copies of the FY2019 guidelines, technical assistance or to be added to the contact list for minigrants, the regional arts network and other arts related opportunities, please contact Mary Bevans Gillett, regrant coordinator, at 231-883-8388 or mgillett03@gmail.com. Artists, organizations, businesses, and others in the creative sector are invited to participate in the Northwest Michigan Arts & Culture Summit May 23 at the Interlochen Center for the Arts. This is the second annual regional summit to strengthen relationships, support cultural economic development & continue building the ten county arts and culture network. Sessions will focus on cultural tourism & community engagement, hands-on tools & strategies, & creating a ‘next steps’ road map with priorities, goals & champions to take us forward. The event will run from 9:00 a.m. to 3:30 p.m. at Interlochen’s Mallory-Towsley Center for Arts Leadership. • Hands-on planning to map specific network goals, initiatives and action steps. • Susan Wenzlick, Writer, Consultant & Placemaking Specialist, OrdinaryVirtues. Cost to attend the Summit is $15 (including continental breakfast and lunch). Registration is available online at: nwm.org/artsummit. For more information, contact Mary Gillett at mgillett03@gmail.com or 231-883-8388. The 2nd annual Northwest Michigan Arts & Culture Summit is supported in part from a Rotary Charities seed grant. International Sculpture Day was April 25. Let’s make any day a great time to enjoy public art dotting our Northern Michigan map. Need ideas? Check out Michigan Legacy Art Park in Thompsonville, Art Rapids! 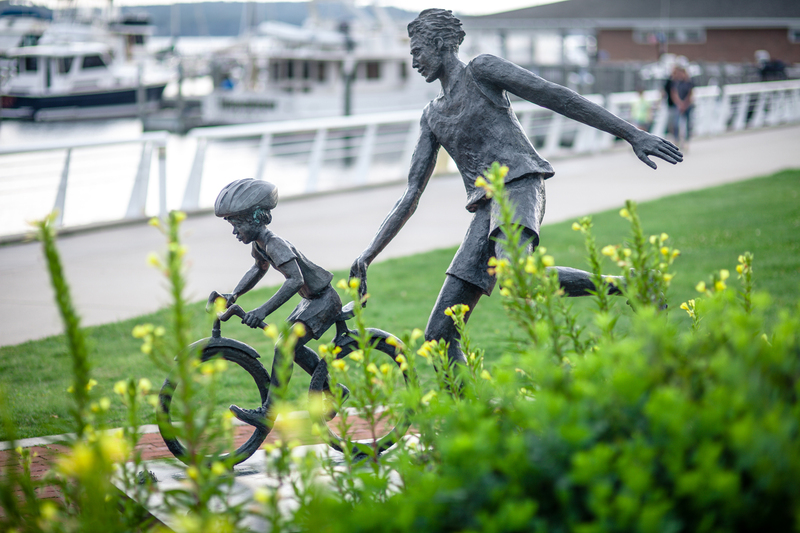 Walk of Art in Elk Rapids, Northwestern Michigan College, Interlochen Center for the Arts, City of Traverse City and communities throughout the region. NW Michigan Regional Arts Gathering, 4-5:30pm, Tuesday, 4/25 at Crooked Tree Arts Center – Traverse City (322 Sixth St., Traverse City). Join artists, organizations and creatives to discuss next steps in building the NW Michigan Arts & Culture Network. MCACA Region 2 Grant Workshop, 5/4, 11:30am-1:30pm at Traverse City Area Chamber of Commerce (202 E. Grandview Parkway, Traverse City. Information and assistance regarding te MCACA grants and minigrants available for FY2018. Save the Date – 2nd Annual NW Michigan Regional Arts Summit, May 23 at Interlochen Center for the Arts. For more information, contact Mary Gillett at mgillett03@gmail.com. Artists, performers, advocates, organizations, and others in the creative sector are invited to participate in one of eight community sessions hosted by the Northwest Michigan Arts & Culture Network throughout the region during April. Collaborating with local partners in each county, sessions are planned as community conversations to seek feedback on next steps in building the network and advocating for arts and culture throughout northwest Michigan. All are open to interested attendees at no charge. Learning: Professional development/educational opportunities for organizations, disciplines and individuals. Sharing information for continued learning and access to resources. Promoting: Ability to cross promote and collaborate on PR/marketing/communications for greater reach and efficacy. Strengthening/Increasing Access to Funding: Developing strategies for greater business support, community partnerships, cultural economic development and funding opportunities. Advocating: Opportunities to advocate for funding/support for arts, culture and arts education via local, state and Federal governments and related entities. Results and insights will be compiled and used at the 2nd Annual Regional Arts Summit slated for May 23 at Interlochen Center for the Arts. Sessions are planned on the following dates, times and locations. All are open to to interested attendees at no charge. For more information or to get involved, contact Network Co-convener Mary Gillett at mgillett03@gmail.com or 231-883-8388.